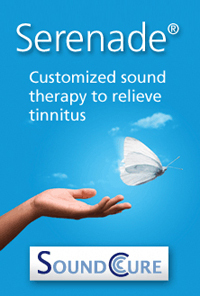 The Serenade system consists of a handheld device, earphones, and proprietary treatment sounds known as S-Tones ®. Independent research has suggested S-Tones may address the underlying neurological cause of tinnitus.1 It may be used to seek immediate relief, or used as part of an ongoing tinnitus treatment program for potential long term benefit. After an audiologist evaluates your tinnitus, your Serenade device is programmed to play the sounds most likely to be effective for you. 1 in 10 American adults suffer from tinnitus 2 (ringing in the ears). Many tinnitus sufferers are not offered treatment but are told to “just live with it.” We now offer a new sound therapy solution that may bring you relief. New treatment approaches are successfully providing relief for many. Our office is dedicated to staying abreast of new technological developments, and sharing them with our community. 1. Reavis, Chang and Zeng. Patterned sound therapy for the treatment of tinnitus. Hearing Journal, 63(11): 21-24, Nov 2010.